Over the course of his career, Neil Gaiman has written a number of essays, introductions, and speeches. The View from the Cheap Seats pulls together over sixty of these pieces in one place for the first time. For veteran fans of Gaiman, many of these writings will revisit previously seen works. For newer fans, The View from the Cheap Seats is a rare and quite interesting look into the mind of one of the greatest modern writers. The book’s preface sets the tone the collection with Gaiman’s personal credo: a very brief summary of the basic tenants by which he lives his life and which influence his writings. Many of Gaiman’s beliefs seem self-evident: killing or maiming others to suppress ideas doesn’t work. Neither does attempting to control the ideas or thoughts of others. Gaiman argues that ideas in and of themselves are neither good nor bad – they simply exist and members of society should be free to express those ideas no matter how vile or reprehensible they seem to others. Rather, Gaiman states, it is up to each person to counter and persuade those representing the vile and reprehensible over to their side. From there, Gaiman jumps into a speech on the importance of libraries that he gave in 2013 for the Reading Agency, a U.K. charity whose mission is to help people become more confident readers. Gaiman admits that, as an author, he is biased towards libraries. He also gives the reader a small insight into how libraries and librarians shaped his path when he was a child. During the summer months, his parents dropped him at the library on their way to work and picked him up on their way home. There he worked his way through the card catalogue looking for books on vampires, witches, detectives, and other wonders. After he had finished with the children’s library, he began on the adult books. During this process, the librarians nurtured his love of reading by teaching him about interlibrary loans and steering him toward other books he might enjoy. Touching on his personal credo from the opening of the book, Gaiman later talks about Charlie Hebdo and the PEN literary gala. Since six tables had pulled out of hosting tables and so Gaiman was asked if he would step in to host one. He agreed and what follows is a deeply personal and touching moment between him and his wife, Amanda Palmer. Palmer tells him he is doing the right thing and then asks “Will you wear a bullet proof vest?” Gaiman argues that security will be tight and tries to assuage her fears by assuring her a vest will not be necessary. The View from the Cheap Seats is an odd mixture in both quality and subject matter. Some of the writings are deeply personal, giving the reader a rare and intimate view into the writer’s childhood, school life, and very early career. Gaiman shares his personal insecurities in interviewing authors he has long admired and reveals the origins of his friendships with figures such as Tori Amos, and Terry Pratchett. Included among these is a moving tribute to Douglas Adams. Other elements of the book are as ungainly as their titles suggest, such as “A Speech to Professionals Contemplating Alternative Employment, Given at PROCON, April 1997.” As a reader and a reviewer that particular entry was a head scratcher. Even in the seemingly banal, however, Gaiman manages to shine by offering an intriguing look into the publishing industry just before the Internet exploded and changed everything. Throughout the book are numerous personal anecdotes of people famous and otherwise with whom Gaiman has formed close relationships over the course of his career. Few though are as touching as the tribute to his wife’s late surrogate father, Anthony. Intertwining themes of living and dying, Gaiman reveals the path of his relationship with Palmer and by extension, Anthony. Ironically, Gaiman and Palmer meet as a result of her commissioning Gaiman to write a handful of stories and poems for her album “Who Killed Amanda Palmer?” During their first date, she introduces Gaiman to Anthony who proclaims that he thinks Gaiman would make a good boyfriend. Despite not yet realizing Anthony’s importance to Palmer, Gaiman is nonetheless pleased. Anthony soon becomes not simply Palmer’s close friend but a trusted confidant and counsel to Gaiman. Then, approximately six months after Gaiman and Palmer are married, Anthony is diagnosed with leukemia. In the midst of this, two other of Gaiman and Palmer’s friends die unexpectedly. Finally, the news is delivered that Anthony is in remission. Sadly, however, a post-script reveals that Anthony in fact died from leukemia in June of 2015. What is not revealed in the piece, but is of importance, is that three months later, Palmer gave birth to a son, named Anthony in honor of their dear friend. Fans of Gaiman’s previous works will find themselves enthralled with The View from the Cheap Seats. Gaiman has long had a reputation for being open and accessible to fans. 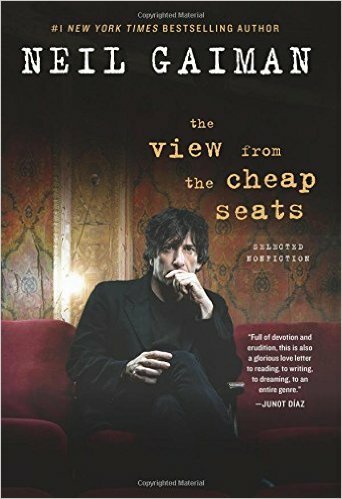 The View from the Cheap Seats, however, offers a deeper, more intimate look at Gaiman’s early life and career. One can easily imagine from his prose a serious and quiet little Neil Gaiman stuffed into the corner of his local library. Those previously unfamiliar with Gaiman should enjoy his conversational style and dry humor. Gaiman is that rare mixture of both famous and unassuming. It is clear from his writing and the stories he relates that he is exactly as he seems: a somewhat befuddled English bloke who likes to tell stories.